Kahanism is an extremist Jewish ideology based on the views of Rabbi Meir Kahane, founder of the Jewish Defense League and the Kach party in Israel. Kahane maintains that the majority of Arabs living in Israel are enemies of Jews and Israel itself, and that a Jewish theocratic state, where non-Jews have no voting rights, should be created. The Kach party has been banned by Israel and labeled a terrorist group by the U.S. State Department. While it is difficult to define Kahanism in an official manner, the term has come to denote the controversial positions espoused by Rabbi Meir Kahane. Kahane's positions spanned a broad range of subjects. Aliyah: Kahane believed that every Jew should live in Israel. Anti-Semitism: Kahane believed that anti-Semitism should be fought immediately and by all means necessary. Democracy: Kahane wrote that democracy was the best form of government for those who lacked a divine truth and a standard of good and evil. Hate and Violence: Kahane believed that hate and violence were terrible, but terribly necessary at the right time and place. Holocaust: Kahane felt that the Holocaust should be taught to youth with all the lessons implied, including the need to fight spiritual assimilation, to physically defend the Jewish people and the importance of leaving what he termed "the Exile". Israel: Kahane proposed that the state of Israel enforce Jewish law, as codified by Maimonides, under which non-Jews wishing to dwell in Israel would have three options: remain as "resident strangers" with all rights but national ones, which would require non-Jews to accept resident-stranger status with all rights but political ones. Those who were unwilling to accept such a status would be required to leave the country with full compensation or, for those who refused even that, be forcefully removed. Judaism: Kahane stressed that Jewish is beautiful. He felt that the Reform and Conservative movements have been a leading cause in assimilation due to their dropping of mass Revelation as the cornerstone of Jewish theology. Love of Fellow Jews: Kahane emphasized the importance of loving Jews and the willingness to sacrifice for Jewish brothers. Pride: Kahane felt that Jews should embrace pride in their heritage and tradition. Respect: Kahane would state that there is nothing more important than respect and that only one who respects himself could end up respecting others. Torah: Kahane wrote that every Jew should have enough Torah knowledge to be a qualified rabbi. 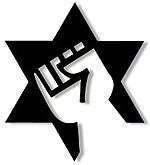 Unity: Kahane felt that Jewish unity was of utmost importance, and that everything should be done to avoid a civil war. The central claim of Kahanism is that the vast majority of the Arabs of Israel are now, and will continue to be, enemies of Jews and Israel itself, and that a Jewish theocratic state, governed by Halakha, absent of a voting non-Jewish population and including Israel, Palestine, areas of modern-day Egypt, Jordan, Lebanon, Syria and Iraq, should be created. According to Kahane, the term "Kahanism" is used primarily by those ignorant of Torah Judaism to discredit his ideology, which he asserted to be rooted in Halakha and the same as Torah Judaism. "Meir Kahane did not hate the Arabs – he just loved the Jews", said his widow Libby in her November 20, 2010 TV interview. Kach and Kahane Chai, the now defunct political parties/movements of the Kahane followers based in Israel with supporters in the United States. Kach has been designated as a terrorist organisation by Israel, Canada, the European Union, Switzerland, Chile, Argentina and the United States. The deadliest Jewish terrorist attack was when Dr. Baruch Goldstein, supporter of Kach, shot and killed 29 Muslim worshipers, and wounded another 150, at the Cave of the Patriarchs massacre in Hebron, in 1994. This was described as a case of Jewish religious terrorism by Mark Juergensmeyer. :10Goldstein was a medical doctor who grew up in Brooklyn and was educated at the Albert Einstein College of Medicine in the Bronx. He resettled to the Kiryat Arba settlement in the West Bank, and was politically active for years – he saw Rabbi Meir Kahane as a hero,:53 and had been Kahane's campaign manager when he ran for the Israeli parliament through Kahane's Kach party. :8 When Goldstein was threatened with court-martial for refusing to treat non-Jewish soldiers in the Israeli Defence Force, he declared: "I am not willing to treat any non-Jew. I recognize as legitimate only two religious authorities: Maimonides and Kahane." Goldstein was denounced "with shocked horror" by Orthodox Judaism, and most in Israel denounced Goldstein as insane. Israeli Prime Minister Yitzhak Rabin condemned the attack, describing Goldstein as a "degenerate murderer", "a shame on Zionism and an embarrassment to Judaism". At the same time, Goldstein's actions were praised by the extremist settlers; Yochay Ron said that he "felt good" when he heard the news, and stated that Jews were "at war with the Arabs" and "all Arabs who live here are a danger to us... they threaten the very existence of the Jewish community on the West Bank. ":52 Goldstein and other religious settlers at Beit Hadassah (both Kahanist and Gush Emunim) believe that the biblical lands on the West Bank are sacred, that Jews are required by God to occupy them, and that the presence of Muslims desecrates the holy land. :51–52 After this attack, members of the Kach Party praised Goldstein's actions, and in the ensuing political turmoil, the Knesset banned Kach in Israel. The Shamgar Commission in Israel concluded that Baruch Goldstein acted alone. In October 1982 Yoel Lerner, a member of Meir Kahane's Kach, attempted to blow up the Dome of the Rock in order to rebuild the Temple Mount site. :45 He was sentenced to two and a half years in prison. Mark Juergensmeyer identified him as a Jewish religious terrorist, writing that he "yearned for a Jewish society in Israel. He hoped for the restoration of the ancient temple in Jerusalem, the exclusive right of Jews to settle on the West Bank of the Jordan River, and the creation of a state based on biblical law. ":45 Lerner had previously served a three-year sentence for heading a group that plotted to overthrow the government and establish a state based upon religious law. On August 4, 2005, Eden Natan-Zada, an AWOL Israel Defense Forces soldier, killed four Israeli Arab citizens and wounded several others when he opened fire on a bus in the northern Israeli town of Shfaram. Natan-Zada had recently moved to the settlement of Tapuach, site of a Kahanist yeshiva. Zada was handcuffed by the Israeli police who arrived to the scene but then lynched by the mob. Roadside shootings, stabbings and grenade attacks against Palestinians have been carried out in Jerusalem and the West Bank by individuals or groups suspected of having ties to the former Kach group. Aliases such as "The Committee for the Safety of the Roads" , "The Sword of David" and "The Repression of Traitors" have been used. The US government claims that these are all aliases of "Kach", . In 2002, a Kahanist group known as "Revenge of the Toddlers" claimed responsibility for a bombing attack at Tzur Baher, an East Jerusalem secondary school for Arab boys, that wounded seven. The group also claimed credit for the 2003 bombing of a Palestinian school in Jaba that injured 20 and was thought to be linked to the 2002 Zil Elementary school bombing. Kahanist groups and organizations in the United States are largely inactive, with the bulk of their supporters immigrating to Israel over the years. Kahane Net, the Jewish Defense League and B'nai Elim (formed by former JDL activists) are occasionally associated with Kahanism. James David Manning has endorsed aspects of Kahane's ideology. ↑ God's Law: an Interview with Rabbi Meir Kahane at the Wayback Machine (archived February 19, 2009): "Any non-Jew, including the Arabs, can have the status of a foreign resident in Israel if he accepts the law of the Halacha. I don’t differentiate between Arabs and non-Arabs. The only difference I make is between Jews and non-Jews. If a non-Jew wants to live here, he must agree to be a foreign resident, be he Arab or not. He does not have and cannot have national rights in Israel. He can have civil rights, social rights, but he cannot be a citizen; he won’t have the right to vote. Again, whether he’s Arab or not." ↑ Maimonides. Mishne Torah, Laws of Kings, Ch. 6. ↑ Meir Kahane. Uncomfortable Questions for Comfortable Jews. p. 250. All Arabs who are prepared to accept the State of Israel as the exclusive state of the Jewish people and of no one else, will be allowed to remain in the land with the status of "resident stranger," as per Jewish laws. They will be granted personal rights but no national ones. They will have general economic, social, cultural, and religious freedom but will not be citizens of the Jewish State and will have nothing to say in its future in any way. Accepting this status, they are welcome to remain and are entitled to all the respect and decency that Judaism demands we grant to all humans who are resident strangers in our land and who bow to its laws and concepts. ↑ God's Law: an Interview with Rabbi Meir Kahane at the Wayback Machine (archived February 19, 2009): "The southern boundary goes up to El Arish, which takes in all of northern Sinai, including Yamit. To the east, the frontier runs along the western part of the East Bank of the Jordan river, hence part of what is now Jordan. Eretz Yisrael also includes part of Lebanon, and certain parts of Syria, and part of Iraq, all the way to the Tigris river." ↑ : "I am committed to Judaism and real Jewish values, and every word in this book – disagreeable as it may be to most – is Judaism." ↑ "Terrorist Organization Profile: Kach". National Consortium for the Study of Terrorism and Responses to Terrorism. University of Maryland. ↑ "COUNCIL COMMON POSITION 2009/67/CFSP". Official Journal of the European Union. European Union. 26 January 2009. p. L 23/41. 1 2 3 4 5 6 7 Mark Juergensmeyer. Terror in the Mind of God: The Global Rise of Religious Violence. University of California Press. ISBN 0-520-24011-1. ↑ Arych Kizel in Yediot Aharonot, 1 March 1994. ↑ 1 Wilson, Rodney. 2007. Review Article: Islam and Terrorism. British Journal of Middle Eastern Studies. 34(2):203-213. . (accessed 29 August 2010). ↑ West Bank Massacre: The Overview; Rabin Urges the Palestinians To Put Aside Anger and Talk. Haberman, Clyde. The New York Times. March 1, 1994. ↑ Alan Cowell (March 2, 1994). "WEST BANK MASSACRE; In 'Tragic Error,' Soldiers Kill a Settler". New York Times. ↑ Youssef M. Ibrahim (March 6, 1994). "The World; Palestinians See a People's Hatred in a Killer's Deed". New York Times. ↑ Yonah, Tamar (December 21, 2009). "Audio: Reverend Manning Talks About American Black-Jewish Relations". Arutz Sheva. Retrieved December 13, 2010. Kahanism and Democracy - A blog post by Rabbi Gil Student analyzing Rabbi Meir Kahane's ideology (Kahane-ism) and its contradiction with the democratic values of the State of Israel.